Menopause Night Sweats: Symptoms, Treatment, Relief! Midlife is perhaps the time when a woman needs sleep the most to feel more vibrant. But this time of life often brings with it the challenges of insomnia and the discomfort of night sweats. A night sweat is a hot ﬂash experienced at night that usually causes perspiration in the back of the head and chest and dampens sleepwear, pillows, and sheets. A woman may wake up and have to change her clothing and bedding. Some women may have trouble falling back to sleep after a night sweat. Night sweats are one of the most common symptoms of menopause, which typically begins in a woman’s late 40s to early 50s. Scientific studies suggest that as many as 75% of menopausal women experience night sweats. Understanding what to expect, why these symptoms occur, and how to manage them can help a woman best prepare for this transitional period. Keep reading to learn more about night sweats. Oftentimes, night sweats can be so intense that they interrupt a woman’s sleep, which can affect many aspects of her daily life. Common symptoms of night sweats include: sudden and intense heat, irregular heartbeat, nausea, flushing, chills, and headaches. While the exact cause of night sweats is unknown, most experts point to hormonal imbalance as the primary culprit. Estrogen levels during menopause become erratic and eventually begin a steady and permanent decline. This change in estrogen levels affects the hypothalamus in the brain, which is responsible for the regulation of body temperature. As a result, the hypothalamus often prompts a series of physiological reactions, which women experience as hot flashes or night sweats. Treatment of night sweats often begins with lifestyle changes that can help to reduce the frequency and severity of night sweats. This approach typically involves avoiding night sweats triggers, and taking steps to relieve stress and improve diet and exercise. For instance, tryptophan is an amino acid that helps aid in sleep and can be found in dairy products, nuts, and eggs, which all can help to encourage a good night of sleep. 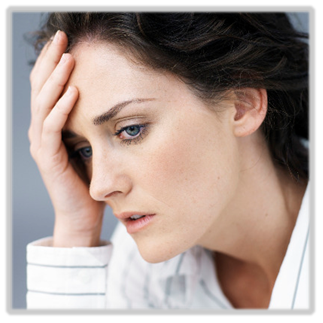 Sleep problems can also be caused by depression, whose incidence more than doubles during perimenopause. Insomnia is one of the primary symptoms of depression. Frequent wake-ups can disrupt REM sleep, which may be important for memory and mood regulation. In fact, reduced REM sleep time, as well as deep sleep time, can contribute to other symptoms we associate with perimenopause, such as fatigue, mood swings, irritability, and trouble concentrating. And as if memory lapses weren’t enough, sleep problems can also contribute to weight gain during perimenopause. Feeling fatigued can weaken the resolve to exercise and eat well, and it can also affect appetite. Reducing sleep time can lower levels of leptin, a hormone that signals fullness. At the same time, a lack of z’s increases hormones that promote appetite. This hormonal double punch may not only create a feeling of intense hunger, it may also prevent a satiated feeling after eating. If you are struggling with night sweats and sleep deprivation, you are not alone. It is very common for women to seek herbal and vitamin supplements as natural treatments for night sweats and natural sleep aids to use for at least a few nights a week when insomnia strikes. At The Healthy Choice Compounding Pharmacy, we have a range of supplements that are safe to use to not only help get night sweats under control but also help with getting a better night’s sleep through the process of menopause. Call or stop by to speak with , our supplement expert.